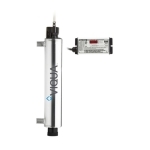 VIQUA Ultraviolet is a reliable, chemical-free way to disinfect your water. Formerly marketed as Sterilight / UV Max. Ultraviolet (UV) is a safe, clean, and simple method of assuring that water is free of bacteria. It is a proven technology with a long history of providing excellent, microbe-free drinking water for residential, governmental and commercial users. 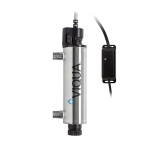 Although in some applications the initial cost is a bit more than chlorination, ultraviolet's low operating cost ensures that it quickly pays for itself. Upkeep is normally just an annual lamp change, and with VIQUA units, changing the lamp is as easy as changing a light bulb in your home. 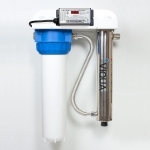 VIQUA UV water purifiers are manufactured in Canada and have for years been a favorite the world over. 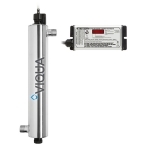 Previously marketed under the brand names Sterilight and UV Max, VIQUA units carry a decades-old reputation for simplicity, durability, and flawless performance. 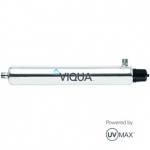 Made of sturdy polished stainless steel, VIQUA ultraviolet systems provide many years of trouble-free service. 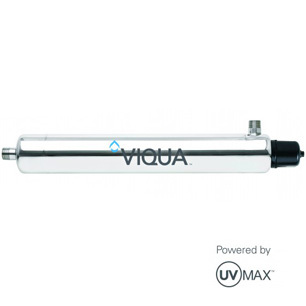 The UV units on this page are primarily from VIQUA's most popular home treatment series. As factory-direct VIQUA dealers, however, we can supply all units and parts for VIQUA, Sterilight and UV Max units on short notice. Please call or email if we can be of assistance. While ultraviolet disinfection was once used mainly with non-chlorinated well water, UV is becoming much more common for city water users. 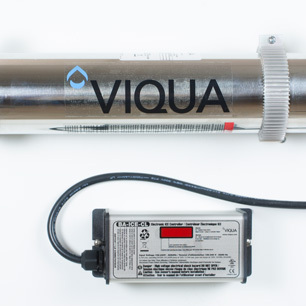 As municipal water infrastructure ages and breaks in pipes and natural events like flooding cause more frequent “boil water” alerts, more and more city water users are relying on ultraviolet to provide a final barrier of protection from bacteria. With a UV unit installed in your home, you can ignore “boil water” warnings. You can also forget about cysts like giardia and cryptosporidium that are not easily controlled by chlorination. Dosage: 30 mJ/cm2 at stated flow-rate. Integrated power supply with power/lamp-on indicator. 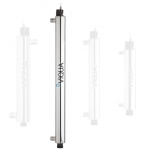 Provides consisent, reliable ultraviolet dosage for 1 year (9000 hours). Quick lamp replacement with no disruption of water flow. Treats chlorine-tolerant cysts, including cryptosporidium and giardia. Power supply visually displays remaining lamp life. Alarm will sound if the lamp fails. CSA and CE compliant power supply is sealed to prevent water damage. 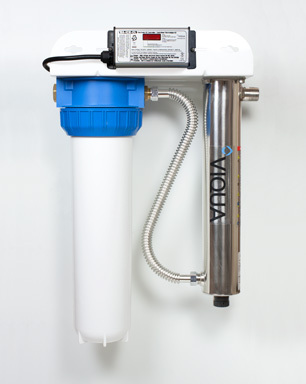 Controller: 7.3" X 3.2" X 2.5"
5 micron sediment cartridge in a superior VIQUA easy-service housing. U-shaped rack that can pointed in either direction to meet the installer’s requirements. 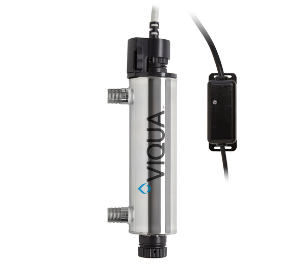 Monitored Silver Plus systems include a UV intensity sensor that warns of changes in UV performance and allow for addition of an optional solenoid valve (sold separately) that shuts off the flow of water to the home if UV performance falls below safe levels. Controller: 8.3" X 3.2" X 2.5"
Lamps should be replaced annually. 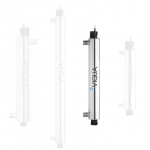 Replacement of the quartz sleeve, a clear tube that encloses the lamp, is optional. Some users replace the sleeve with each lamp change, but it is more common to inspect the sleeve, clean it if necessary, and replace it only if it appears to have lost its ability allow the passage of UV light. 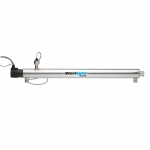 Since the quartz sleeve is the most fragile part of any UV system, it's a good idea to have a spare on hand. Includes lamp, quartz sleeve, and o-rings. Includes lamp & quartz sleeve.